6,828 Shares in Universal Forest Products, Inc. (UFPI) Purchased by First Citizens Bank & Trust Co.
Students at colleges and universities will soon see changes to how their federal student loans are managed. A plan recently announced by the Education Department is intended to simplify a federal student loan servicing system that some have complained is overly complex. The Education Department currently administers roughly $1.3 trillion in federal student loans. The Education Department will streamline federal student loan servicing by moving to a new, single platform for managing the loans. The plan echoes intentions the Obama administration announced last year to create a new, single web portal through which all borrowers could obtain information on their loans. The contract to create the new system is expected to be one of the largest nonmilitary federal contracts. The loans of 43 million borrowers are expected to be managed by the new platform. One of the three remaining bidders for the contract is Navient Corp. Navient, spun off Sallie Mae in 2014, is currently the nation’s largest student-loan servicer. 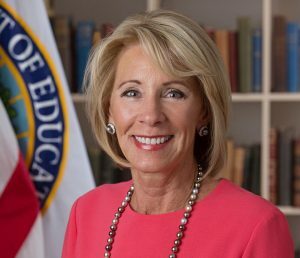 One other bidder is the Pennsylvania Higher Education Assistance Agency, which services loans under the American Education Services and FedLoan Servicing names. The last is a joint bid from Nelnet and Great Lakes Educational Loan Services. Navient is currently fighting lawsuits brought by the Consumer Financial Protection Bureau and two state attorneys general earlier this year over the company’s loan servicing processes. The lawsuit claims that the loan servicer made serious mistakes in its collections process, which illegally increased loan repayment costs for millions of borrowers. Navient has denied the allegations. The Education Department said it would be able to more effectively monitor a single servicer. Other changes eliminated requirements that the Education Department said were confusing, costly, or unnecessary. The biggest change was eliminating required support for back-end subcontractors. The new vendor will now be allowed to service all federal student loans itself. The single servicer will also establish a standardized process for handling customer calls. Some are concerned that the department will be overly reliant on a single student loan company. Critics say because of the single company monopoly, there would be no incentive to provide better customer service. Natalia Abrams, executive director of the advocacy group Student Debt Crisis, said, “With zero competition, we are concerned about a ‘too big to fail’ student loan company that has zero incentive to work for students, borrowers, and their families.” The Education Department has not announced when it plans to award the contract. SunTrust Banks Research Analysts Lower Earnings Estimates for National-Oilwell Varco, Inc.